Are you currently legally living in the United States or are you living overseas? 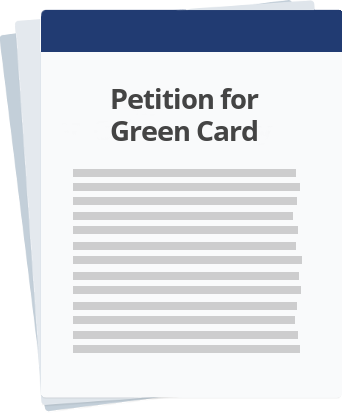 To obtain your green card, you must first determine your eligibility, submit required forms, and follow a specific process. You will likely be required to have your fingerprints taken, attend an interview, and various fees must be paid. This process can be challenging and time consuming without assistance. We make it easier by providing you with the forms and guidance you need to apply for your permanent resident card quickly and effortlessly. Let us get to know your situation so we can customize your documents. Fill out our form and submit payment. Download your documents and instructions for quick and easy filing. A non-citizen (also referred to as an alien), who is interested in permanently living and working in the United States, can seek to obtain a green card to ensure their legal physical presence in the U.S. Whether someone is already in the U.S. through a visa or seeking to travel to the states and stay, the process to obtain a green card can be intricate and time consuming. Without assistance, the process to obtain a green card involves formal legal documentation and complicated filing procedures. We make it easy by providing you with the forms and guidance you need to file for a green card quickly and effortlessly. There are two main ways in which you can file for a green card: through adjustment of status (if you are currently legally living in the United States) or through consular processing (if you are living abroad). Once you obtain your green card, you can live and work in the United States permanently. Because the green card process is very specific to your situation, it is important to carefully read all instructions to ensure that you follow the appropriate process. Specific procedures are in place for filing depending on the type of eligibility you possess. File a petition and wait for your visa number. File an application, attend an interview, go to a biometrics services appointment, and pay required fees (requirements will be specific to your situation). Obtain your green card (also referred to as your permanent resident card). If you'd like help applying for your green card, our $39 package includes forms, detailed procedural instructions, and round-the-clock support from our team. This price excludes filing fees that may be due upon filing.